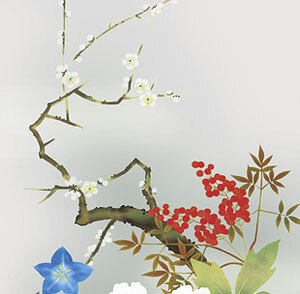 Bird and flower painting scroll Kacho-ga "Japanese flowers of four seasons"
Japanese flowers of four seasons. The original picture of this one is drawn by Yamamura Kanpou. The frame is made from Rakusai Donsu. 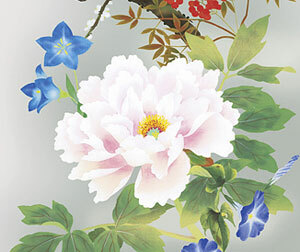 This natural gray frame is bringing out the white peony and colorful flowers. You can hang it all year. Our products are not hand painted because you can easy to get brand-new ones. It is made from GICLEE techniques. 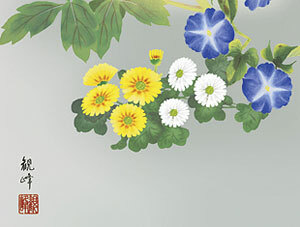 The picture have four seasons flowers. UME: Plums bloom in early Spring. KIKYOU: Chinese bell flower bloom in fall. BOTAN: The word "a peony" in a haiku indicates that the season is winter. KIKU: A chrysanthemum is the flower in the fall. ASAGAO: Morning glory bloom in the summer.